Ten years ago, the demand and expectation for classroom audiovisual technology was only beginning to grow with teachers in the Jurupa Unified School District in Riverside County, CA. "There was very little in the way of AV equipment as we recognize it today," says Thomas Tan, Director-Education Technology for the Jurupa Unified School District. "Classroom AV was difficult to use, equipment was sitting on video carts that were pushed from one classroom to another, and there were many safety and security issues, which added to the frustration of using AV in the classroom." All of that changed a year ago for 45-year-old Rubidoux High School when 62 Extron PoleVault Systems were installed in classrooms. Once we talked to the school district about what they were trying to accomplish, we agreed that the PoleVault System was the most economical technology route and the most beneficial solution for students and teachers alike. Mike Stammire, President of Digital Networks Group, Inc. The PoleVault System has improved the level of student engagement and made managing classroom technology easier for instructors at Rubidoux High. In fact, Tan says the PoleVault System has fundamentally changed the learning environment and improved the quality of instruction delivery at the high school. "The PoleVault System addresses the two main sensory complaints from students, which are 'I can't see' and 'I can't hear,'" Tan says. "Before the PoleVault Systems were installed, teachers would put their laptop, projector, and document camera on a cart in the front of the classroom. Sometimes the cart would block the view of students, and the warmth from the projector exhaust fan was uncomfortable to students sitting near the projector. With the projector mounted on the ceiling, all of that has changed." The PoleVault System's ease-of-use is a major benefit for students, teachers, and facility management. "PoleVault opens the world of multimedia resources to all teachers, because if you can push a button, you can use the PoleVault System. Teachers love it, and teacher enthusiasm is one thing you can't buy," Tan says. "With all of the equipment properly installed and the elimination of handheld IR remote controls, our teachers can now fully concentrate on teaching." Laurel Fretz, Principal of Rubidoux High School, says that the PoleVault System has enabled teachers to easily do what was difficult to do before, including sharing documents and online resources with students. "Because the system is so easy to use and so powerful, they can integrate technology into their teaching more effectively. They're less encumbered, and can spend time planning and researching rather than figuring out ways to present materials," Fretz says. "Also, they don't waste time setting up, plugging, and unplugging. The PoleVault System is all ready to go." The PoleVault System improves classroom risk management by providing a safer environment for students and equipment. "The PoleVault System eliminates the complexity of managing all the stray power, sound, and video cables," Tan says. "With the projector mounted on the ceiling, there's no risk of accidentally tripping over the power cable, and pulling the projector to the floor." Also, because the projector is permanently mounted to the ceiling, it has become extremely difficult to steal. "Out of reach is out of mind," Tan says. "In fact, a neighboring high school recently lost several projectors that were placed on carts or tables at the front of the classroom. PoleVault has definitely worked as a theft-deterrent." 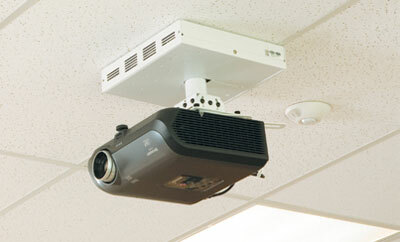 Keeping the projectors out of reach also prevents the accidental abuse from improper operation or overheating, which can damage the projector's expensive light bulb. Problems can occur if projector power is disconnected before cool-down or if there is inadequate ventilation. PoleVault's MediaLink® Controller and ceiling mounting of the projector address both of these issues. Stammire says that in the past, it was a challenge to install a complete system in a classroom that was being modernized or retrofitted. However, with the PoleVault System, installation was much easier and more cost-effective due to the use of flexible twisted pair cables instead of bulky, heavy, and expensive video cables. "It is so much easier to pull CAT 5 cable through an existing wall than trying to route heavy VGA-type cables," Stammire explains. "Also, Extron did a great job of packaging the PoleVault System. The entire system comes in two boxes per classroom. Everything is in those two boxes: mounting hardware, all cables, speakers, switchers, cut-out templates, nuts and bolts – even a small screwdriver to make final adjustments to the system." So far, there have been no problems with the PoleVault System at Rubidoux High. "The system is relatively maintenance-free," Tan says. "I think the classroom is just about the harshest environment for technology that you can imagine, but the PoleVault has performed flawlessly. One of the reasons we decided on Extron's PoleVault System and Digital Networks Group was that both companies have a great reputation for their service and reliability." Extron's PoleVault Systems are complete AV solutions that mount all the switching and audio amplification components securely above the projector. They are easy to install, use, and support, making them ideal for single-projector K-12 classrooms. PoleVault Systems use economical twisted pair cable for transmitting signals, and include network connectivity for Web-based asset management, monitoring, and control. The PoleVault System package includes all the projector control, mounting hardware, switching, amplification, speakers, wallplates, and cabling needed for a complete AV system. All that remains is to add the video sources, projection screen, and projector. Stammire, who has been selling classroom AV systems for many years, says that his favorite features of the PoleVault System are that there are no remote controls in the classroom, and operating the system doesn't require any training for teachers or students. "You press the 'On' button, and it's on. In addition, the PoleVault System is fully integrated into the local and wide area network of the district, and using GlobalViewer, the district support staff can help teachers troubleshoot the system from the district office or from anywhere in the district where a computer is available," Stammire says. Extron's GlobalViewer is a free Web-based AV resource management and remote control application that provides a way to manage, monitor, and control projectors, plasmas, monitors, VCRs, DVD players, and other devices using a standard TCP/IP network. According to Stammire, with Web-based features such as preventive maintenance reminders, lamp hour tracking, and automatic shutoff at predetermined times, the PoleVault System reduces the budget for projector bulb replacement. "An earlier installation at another school without PoleVault required two bulb replacements in every projector during the school year," Stammire says. "I don't know if we've replaced even one bulb in any of the projectors connected to a PoleVault System at Rubidoux High. There's a MediaLink Controller in every classroom to remotely turn off projectors after school hours and on weekends. When you consider that the cost to replace bulbs is gigantic, approximately $350 to $400 per bulb, you realize that the PoleVault System has a great ROI value." The PoleVault System has been a success in simplifying classroom AV and enhancing learning at Rubidoux High School; in fact, it has been such a tremendous success that the Jurupa Unified School District will install additional PoleVault Systems at other schools in the area. Extron's PoleVault System enables all video switching and audio amplification components to be securely mounted above the projector.